Seven Heps teams had the weekend off, but the nine that did compete had some great races at the Coast-to-Coast Battle in Beantown and the Panorama Farms Invitational. Female Athletes of the Week: Dartmouth junior Olivia Lantz was the first Ivy woman (undergrad or alumna) to cross the 5km finish line at the Battle in Beantown on Friday, as she finished in 10th place with a time of 17:30. Out at the Panorama Farms Invitational, Yale junior Andrea Masterson finished fourth in the 5km race in 17:35.1. The Yale women finished second overall in the event, behind only host Virginia (41 points to 67 points). It should be noted that Frances Schmiede (Yale ’17) was second overall in the Panorama Farms race as Virginia’s #1 runner, covering the course in 17:10.4, while Taylor Spillane (Cornell ’17) was Syracuse’s #5 runner at the Battle in Beantown as she finished 64th overall in 18:31. Female Rookie of the Week: Five seconds later, Ella Ketchum crossed the line in 15th place (17:35) – the first female freshman in the field and third Ivy finisher. Dartmouth finished fourth overall with 132 points by having two athletes in the top 15, holding off Cornell (fifth – 143 points) and way ahead of Brown (eighth – 266 points) and Harvard (ninth – 271 points). 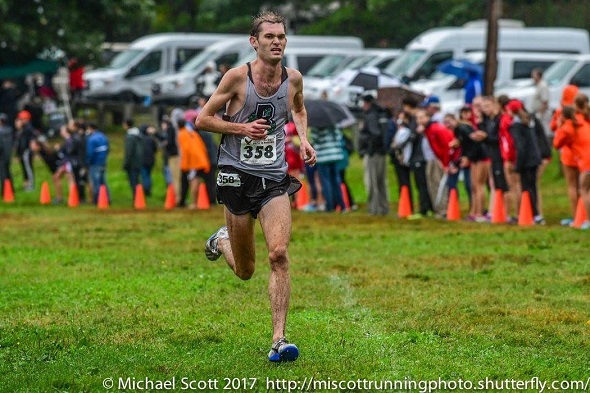 Male Athlete of the Week: Brown senior Matt Mahoney was a top-10 finisher in the rainy, cool Battle in Beantown men’s 8km race, as he finished 8th overall with a time of 24:28. The Brown men finished fourth in the team standings behind nationally ranked Syracuse, Illinois, and Indiana with a score of 117 points (it should be noted that Brown finished only 11 points behind Indiana). Male Rookie of the Week: Harvard freshman Hugo Milner was the second Ivy finisher and third freshman at the Battle in Beantown as he crossed the finish line in 20th place (24:46). Milner was Harvard’s top runner in the race as the Crimson men finished 11th in the team standings with 288 points. Dartmouth also fielded a men’s team in this race, as they finished ninth overall with 247 points. This entry was posted on Tuesday, September 26th, 2017 at 8:48 am. It is filed under Athletes, Featured, Spotlight. You can follow any responses to this entry through the RSS 2.0 feed.